A case can be made that much of what has happened in recent years to rearrange the political landscape, at the very least in Britain, germinated with Ed Miliband’s decision to run for the Labour leadership, and his subsequent failure to secure a successful transition from the Blair years. Among the many moments that saw Miliband distance himself from New Labour is perhaps the only one for which his tenure will be remembered: his refusal in August 2013 to back the Cameron government’s motion for military action in Syria. In the build up to that vote, the violence being committed in Homs and Damascus and Aleppo was alive in the public conscious. In the years since, even as images of rubbled buildings and their bloodied inhabitants continued to flow from the conflict, public concern for what role Britain could be playing has floundered. Accordingly, the British government’s recent interventions have been almost exclusively rhetorical. Today, a letter signed by more than 120 MPs urged the prime minister to authorise immediate aid drops into East Aleppo, where 250,000 people remain. The letter follows a visit to parliament on Tuesday by Raed Saleh, head of the White Helmets, during which he updated a meeting of the All-Party Parliamentary Group Friends of Syria on the humanitarian crisis reaching a new climax in the city. When this conflict began, that it would reach such a pitch without being the subject of a feverish and dominant discourse in Britain would have been unthinkable. 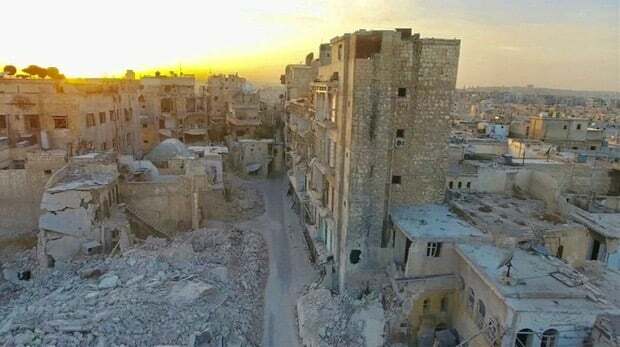 Yet since the current blockade on Aleppo was imposed at the beginning of September, the issue has been raised at Prime Minister’s Questions on only three occasions. On none of those was the questioner the Leader of the Opposition—you will search in vain for mention of Aleppo or Syria on Jeremy Corbyn’s website or social media feeds. When Labour’s John Woodcock raised the subject on Wednesday, the most substantive part of his question asked the prime minister to reassess the case for aid drops. She ignored it. The detached tone here fits a pattern. On the rare occasions the crisis in Aleppo has successfully fought its way to the top of the political agenda, the chief response of Foreign Secretary Boris Johnson has been to pledge that, where war crimes have been committed, their perpetrators will be tried. Retribution is promised for crimes whose victims are still suffering and whose successors are being arranged. On October 11th, Friends of Syria co-chair Andrew Mitchell secured an emergency debate in the Commons, which Johnson closed saying: “I hope that in Moscow and Damascus they will hear the message from British MPs that we are willing to consider anything that can be done to bring peace and hope back to Syria”. But in a Commons session a week later he stated that he hadn’t spoken to Sergey Lavrov, his Russian counterpart, since September 21st, and that was only after a UN aid convoy headed for Aleppo had been bombed. There are now 29 doctors left in the city, down from 35 at the start of October. On Thursday the UN announced a new plan for aid deliveries, but all such plans must be approved both by the opposition groups holding the city and the Syrian and Russian governments. The areas where aid drops are most needed are within a 15-minute flight of where British jets already take off and could be reached via airspace already used by the Coalition. A generic estimate by the UN’s World Food Program puts the cost of a one-tonne aid drop at $1600, while the White Helmets have said they are ready to coordinate collection and distribution. It is within the government’s means to deliver some modest hope to Aleppo. It can hardly be denied that the EU referendum has over the last year rendered Britain disorientated and inward-looking. Whatever one makes of the result, a “historic opportunity” to provide global leadership, as the prime minister described Brexit two weeks ago, it has not so far proved to be. But the triumph in the United States of Donald Trump, driven by many of the same forces, is likely to leave the most powerful country in the world less willing to deploy its resources and influence when they are desperately needed. That will leave a shortfall in Western leadership which Britain would do well by itself and others to make up. If those pursuing Brexit really believe it is an opportunity to “stand tall again on the world stage”, now is the time to prove that they are not simply romantics invoking an imperial past to which we cannot and should not want to return. When at Tuesday’s Friends of Syria event it was realised that only three MPs were in attendance, an emotional former advisor to Tony Blair rose to assure Saleh that the citizens of Aleppo had friends and allies in Britain. Before sitting he won applause expressing shame at how feebly the issue has featured in frontline politics here in recent months. Parliament has now risen to his challenge. The government should follow its lead. Perhaps the only moment for which Ed Miliband's tenure will be remembered is his refusal to back the Cameron government’s motion for military action in Syria. In the years since the vote, even as images of rubbled buildings and their bloodied inhabitants continued to flow from the conflict, public concern for what role Britain could be playing has floundered. It is within the government’s means to deliver some modest hope to Aleppo.